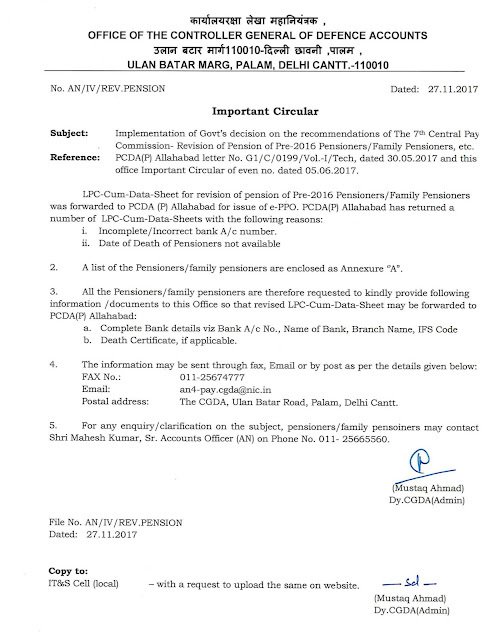 Reference: PCDA(P) Allahabad letter No. G1 / C /0199/ Vol.-I/Tech, dated 30.05.2017 and this office Important Circular of even no. dated 05.06.2017.
i. Incomplete/Incorrect bank A/c number. 2. A list of the Pensioners/family pensioners are enclosed as Annexure "A”. IT&S Cell (local) - with a request to upload the same on website.